After several days of negative performance, stocks rallied in the last two days to close generally flat. For the week, the S&P 500 lost 0.03%, the Dow fell 0.55%, and the Nasdaq gained 0.46%. Economic data last week was generally ho-hum except for two reports. Weekly jobless claims plunged to their lowest level in seven years, giving investors hope that the labor market is moving into high gear. Keep in mind that this measure is highly volatile, and it's wise to wait and see if the trend continues. Another report showed an unexpected jump in April housing starts, which could indicate the beginning of resurgence in the housing market. Groundbreaking on new houses surged 13.2% in April as warmer weather and rentals buoyed demand for multi-unit buildings. Investors who watch bond markets have probably noticed a puzzling downward trend in bond yields. Despite several new records for major stock indexes and an economy that might be reaching escape velocity, the yield on benchmark 10-Year Treasury bonds have been on a downward trend since the beginning of the year. To give you a quick refresher, bond yields and bond prices are inversely related, meaning that as demand for bonds goes up, yields come down. Conversely, bond yields go up when demand falls. 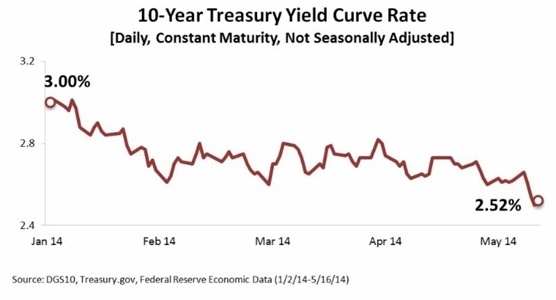 Typically, stronger economic performance leads to higher Treasury yields. Given recent stock market highs and better economic performance, we should see demand for Treasury bonds to go down as investors embrace risk and seek greater returns elsewhere. In fact, we're seeing the opposite. Inflation is still muted. Higher inflation generally leads to higher interest rates and higher bond yields. The Fed doesn't appear to be in a hurry to raise interest rates, putting downward pressure on yields. The European Central Bank has pledged to lower interest rates to spur economic activity, driving up demand for U.S. bonds. U.S. debt is attractive to investors seeking high liquidity and lower default risk. Global jitters from the crisis in Ukraine are pushing investors into Treasury bonds. It's hard to know exactly where bond yields will go, but many analysts think that demand will remain high for the foreseeable future. Lower borrowing costs may spur business activity as companies are able to lower financing costs and prospective homebuyers can find mortgages at attractive rates. While the relationship between bond markets and stock markets is complex, lower bond yields might support higher stock prices as investors seek higher returns. On the other hand, frazzled investors may see plummeting Treasury yields as a sign that the economy is not picking up and turn bearish on equities. Looking ahead, this week is fairly light on economic data, but the housing market will be in the spotlight as analysts determine whether home sales data supports the upward trend in housing starts. Elsewhere, several important Fed economists, including Janet Yellen, will be speaking about the economy throughout the week, and the minutes from the most recent FOMC meeting will be released. Consumer sentiment slips in May. An important gauge of consumer sentiment dropped below expectations as gloom over stagnant wage growth clouded consumer confidence. Economists raise Q2 GDP estimate. Fed economists believe that the economy is growing at a faster pace in the second quarter than originally thought. Analysts see the economy growing at an annualized rate of 3.3%, up from 3.0%. Retail sales edge up slightly in April. After two straight months of strong gains, retail sales hit the brakes last months, rising just 0.1%. Consumers reined in spending across multiple categories, but analysts still believe consumers are on track to spend more this quarter. Industrial production declines in April. Manufacturing fell 0.6% in April after two straight months of gains. Analysts are taking a wait-and-see approach to see if the general upward trend in activity continues next month.